If you want to improve your fitness and feel better about your health, we are here to give you the confidence to do it right. For those that are finishing up physical therapy, our trainers work directly with our Physical Therapy Staff to ensure that your workout is appropriate for your area of injury, further improves your fitness, and reduces the rate of re-occurrence of injury. Our Personal Trainers have many years of experience and use a medically based approach to their program. Meet our trainers. Satisfied medically based personal training client Shirley Mower-Fenoff. Many clients successfully complete their Physical Therapy, but are still not ready to safely return to all of their desired activity. Once pain is resolved and normal movement patterns are restored, some people can be vulnerable to injury. That may be especially true for clients who have been living with their condition for a number weeks or months before they initiate Physical Therapy. We resolve this issue with Medically-Based Personal Training. The goal of Medically-Based Personal Training is to safely transition a client from the completion of Physical Therapy to their desired level of activity, function, and fitness through collaboration between rehabilitation and exercise professionals. • Professional Oversight: Each client’s training program is executed under the supervision of their rehabilitation professional. If questions, concerns, or complications occur, the overseeing Physical Therapist is able to perform further evaluation, assist in modification of the program, or make appropriate referrals to other medical providers, where applicable. 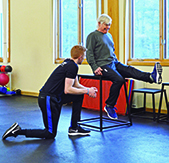 • Communication/Team Approach: Trainers are introduced to clients while they are still being seen by the Physical Therapist, allowing for thorough introduction and smooth transition into the post-rehab environment. There is direct communication from the Physical Therapist to the Trainer regarding the client’s deficits, concerns, and medical precautions. 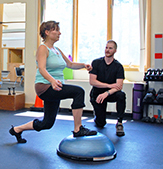 Affordability: As a commitment to our clients, all Physical Therapy clients completing their plan of care are offered Medically-Based Personal Training at a reduced rate for up to 8 weeks following discharge from treatment. This allows the client to smoothly transition into their training program for optimal results. A personal trainer helps you define specific and attainable goals, and how you can measure your progress toward meeting them. As with any journey, you’ll need to know where you want to go and how to know when you’ve gotten there. A personal trainer creates customized workouts based on your condition, medical background, and what you want to achieve. It won’t just be a “general” workout, it will be your workout tailored to your goals. A personal trainer will teach and demonstrate workout movements, and then guide you as you learn them yourself, in order to prevent injury and to equip you to exercise on your own. Sharing your goal and establishing a schedule for workouts is a great way to maintain momentum, and a personal trainer will celebrate your success with you as you make progress. A personal trainer will help you measure your success, and keep you accountable to—or adjust –your goals as needed. Scheduling with a trainer will also ensure that you have regular time set aside to work out. Changing up your workout periodically will keep you from getting bored, and a personal trainer can offer a range of different ways to work target areas—and at levels that are appropriate to your development.